When I first opened the new Holiday Catalogue I was drawn to the Merry Christmas To All stampset and coordinating Thinlits. I think it is the lovely font and all of the possibilities for the words. My card features this stampset and thinlits as well as the Tin Tile Embossing Folder. I really like the vintage feel of the card. Score Cherry Cobbler cardstock (8 1/2" x 5 1/2") in half to make card base. 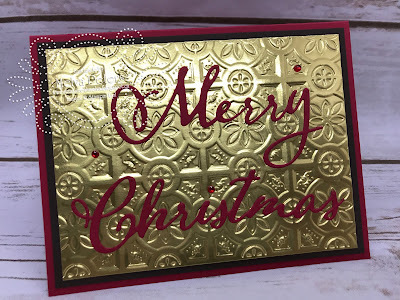 Run Gold Foil Sheet (5" x 3 3/4") through Big Shot using Tin Tile embossing folder. Adhere a piece of Multipurpose Adhesive Sheet to the back of a piece of Cherry Cobbler cardstock. 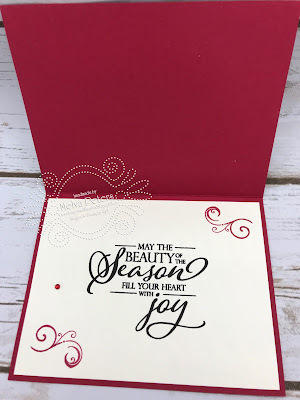 Cut out "Merry" and "Christmas" using the Thinlits and Big Shot. Gently remove the backing from the words and adhere them to the embossed Gold Foil Sheet. Adhere the Gold Foil Sheet to the Early Espresso cardstock (4" x 5 1/4"). Adhere this to the card base. 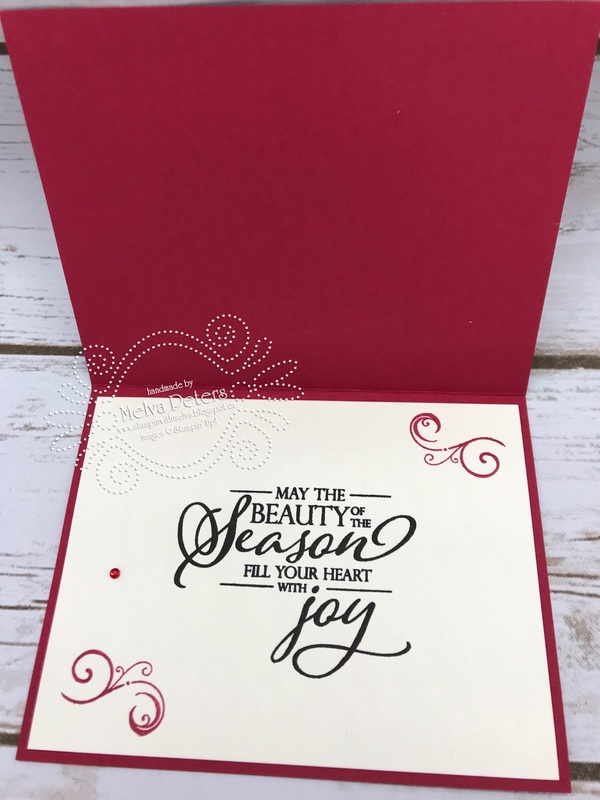 For the inside, stamp your sentiment on a piece of Whisper White cardstock (4" x 5 1/4"). Adhere to the inside of the card base. 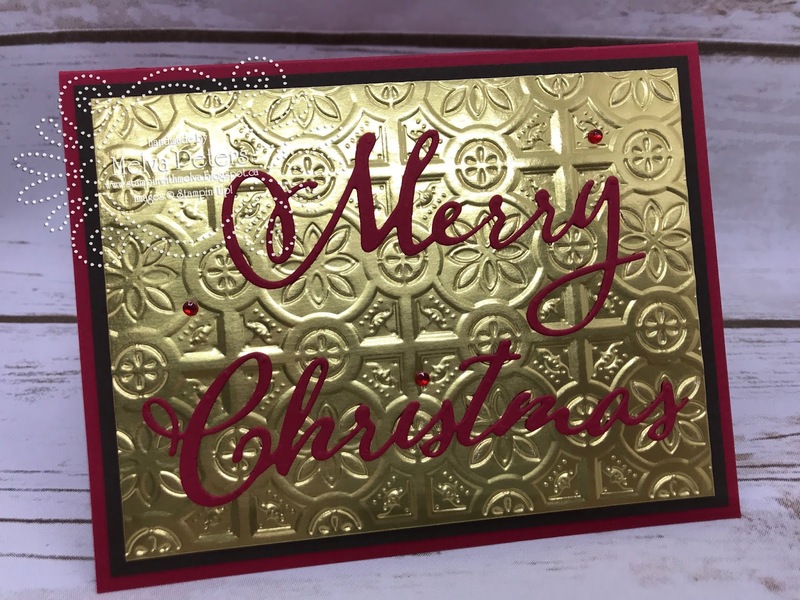 Add Red Rhinestones to the top of the "i" in Christmas and to cardbase.